I'm not sure but it does look pretty good... It's one of those new PlayStation 4 titles, right? I automatically think of like a stone age console. It ain't a point'n'click either, it's an UNGHa'n'BUNGa. 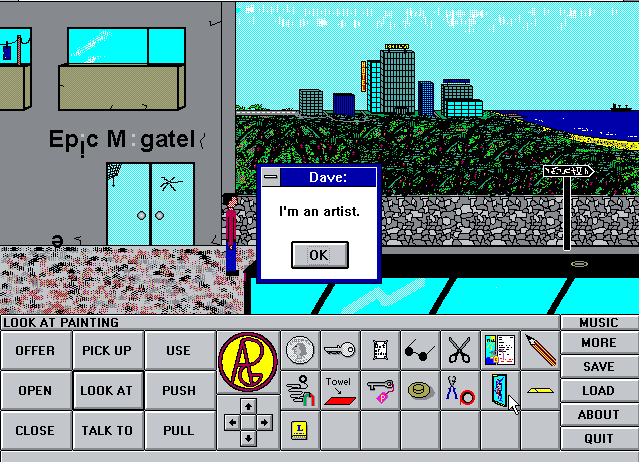 First adventure game for Win 3.11? Seriously . Interface style is very Win 3.11-esque. Nobody considered some hardly working Klik & Play witchcraft? Nobody considered some hardly working Click'nPlay witchcraft? It isn't Klik 'N Play, I think it's some bespoke engine. Some bespoke, awfully programmed engine. First adventure game for Win 3.11? You're correct there, though it's probably not true. This game didn't come out until the very late in Win3.1's life cycle! Was this a boxed commercial game or a shareware release? It was a shareware release. A very obscure one! But one I found on a disk one day and has haunted me ever since. Perhaps this piece of narcissism will jog someone's memory? The Secret of MS Paint Land? I vaguely remember seeing this intertwined "APG" symbol somewhere. Not sure it is "Apogee" though. Nope, and nope! You're getting closer! You should now have all the fabled clues to piece together this terrible game. Can you believe they charged $18 for this? It's Fatty Bear by the same guys who made Putt-Putt. And the name of the game is? Oh, that's too kind. In exchange I make it quick and easy for the next one.